That morning on September 11th, I dropped my wife Ellen and my sister off at work just blocks from the WTC. Since I live in Staten Island, travel across the Brooklyn Bridge was the fastest means of return. I had just crossed the bridge into Brooklyn when the first plane hit. I tried to return to see what I could do, and to retrieve my wife and sister from work in the city, but no one was allowed to leave until it was safe. So, I returned home, distraught and highly disturbed. Being a former marine I wanted to get into the action... to help to do something... just as every good American citizen felt that day, I am sure. The more I thought about it, pictures began to form in my mind, especially after watching some of the attack on the television. As I began to focus, I just kept watching and this picture formed. I sat down in my small studio in the hall, looked at the canvas and I just began to paint. I continued to paint, paint and paint, adding one thing onto another to show how America was shocked by this terrible attack. For this reason, I pictured the American Eagle with a shocking look on his face, not a fearful look, but a shocking look in his eye. I painted him in a manner that looks like he just stopped in mid-air with the flag in his talons and a ribbon across the beak of the eagle that reads 9-11-01, Flight 93, Let's Roll! Immediately below that I decided to paint myself in a camouflaged outfit with an M16 assault riffle, and that was the only one that was in the painting. Later, I added 3 more and a raft. I made it like a group of recon marines springing into action, which is how I felt at the time. Right below that I painted a marine F16, because I heard so many jets overhead and all over the place. I put some bombs on it that read NYPD, FDNY and PAPD. Below that I sketched up a couple of black hawk attack choppers, US Army style and below that I have left it for all the heroes that we lost. One thing that is very important. All over the news and everywhere I looked I saw debris and the buildings, the towers coming down with all those innocent people in them. No where did I see what was going on before the collapses took place. In my heart I just wanted to capture what the scene must have been like just moments before and during the towers collapsing. 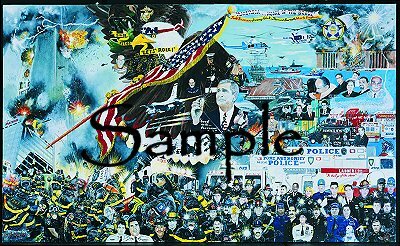 The only way I could do that was to paint all the firefighters and rescue people, including the civilians in the upper right hand corner, involved, alive doing what they do best which is saving lives. They laid their lives down for their friends and for many a stranger whom they did not even know. This is the most honorable, brave and heroic thing anyone could ever do. So, I named the painting "NO GREATER LOVE" after the Bible verse John 15:13 that says: "GREATER LOVE HATH NO ONE THAN THIS, THAN TO LAY DOWN ONE'S LIFE FOR HIS FRIENDS". I don't know how the name came to me, it just hit me and immediately tears began to flow from my eyes, but they were really from my heart. When I told my wife, Ellen, she said that was a perfect name. She said "John, no way are you going to change that name. It is perfect." So that is what I did. Member of the Fraternal Order of Police in Hicksville, New York. 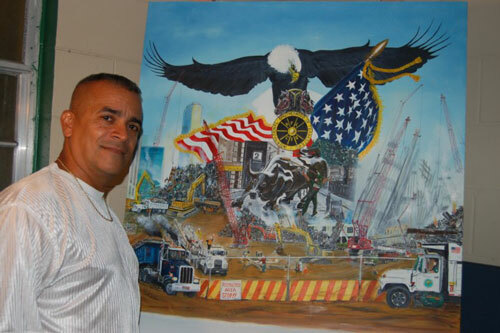 Posters by John Martinez Painting of his 911 Masterpiece "No Greater Love"
If you were at Ground Zero you are entitled to a free poster please let us know when ordering!